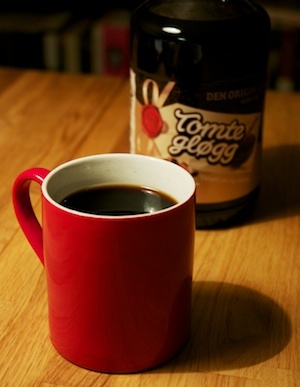 In the time leading up to and around Christmas, it is quite common in Norway to drink something called "gløgg". It is also known as "julegløgg", with "jul" meaning Christmas, or "tomtegløgg", which is actually the name of what I'm guessing is the most popular brand. "Tomte" is a Swedish word for "nisse" which is sometimes used in Norwegian as well. Gløgg is usually sold as a sort of syrup, consisting of water, sugar and extracts of various spices, and this syrup is supposed to be mixed twice as much water or red wine, and heated. It is also common to add rasins and/or chopped almonds. In the last week or so before Christmas, it is not uncommon for shops to have someone handing out cups of the non-alcoholic version of gløgg to Christmas shoppers (in Norway it's illegal to give away alchohol for free to the general public). The version with red wine is more commonly used at pre-christmas parties, either at specific gløgg-parties, or as a welcome drink at a party. Incidentally, I've been appointed second gløgg-assistant at the julebord I'm attending this week. I tried reading the list of ingredients of the bottle of gløgg i bought today, but the spices are hidden behind the unhelpful label "aroma", so I'm not entirely sure what it consists of. Still, from the taste I'm guessing clove buds, cinnamon, cardamom, ginger and maybe others. As these spices, as well as sugar, make up most of the interesting ingredients of gløgg, it is pretty much the same as mulled wine, except for some reason it has become common in Norway to sell it as a syrup rather than dry spices. I've tried a couple of times to make mulled wine by heating wine and adding what I imagined to be the appropriate amounts of the previously mentioned spices, but I never got the hang of it. However, in the UK you can easily find pre-made packages (essentially a large tea bag with spices), containing spices in the proper amounts and proportions for mulling a bottle of wine, and I must say I actually prefer those to the Norwegian gløgg. I always feel gløgg has a slightly artificial taste, and I suppose they must do something unpleasant to the syrup, as you can keep even an opened bottle for quite a long time without any observable change. Note to Camilla: remind me to bring home a bunch of those mulled wine packages. I love mulled wine as well, but I feel it is something entirely different. I think you should bring loads and loads of it when you come on 15th, and then we should force the Edinburgh crowd to taste it with water and with wine. Lots of sugar usually let's you keep something for a long time.